EPC Solutions (Kent) provide Commercial and Domestic Energy Performance Certificates, Domestic Legionella Risk Assessemtns and Floor Plans. We welcome instructions from Private Individuals marketing their own property as well as Property Professionals involved in Buying, Selling and Letting looking for longer-term business relationships. We are able to remove the jargon and explain the whole process in words that you can understand. Based on the outskirts of both Maidstone and Rochester in Kent we are ideally located to cover Kent, Sussex, Surrey and parts of South East London and South Essex. EPC Solutions Provide Legionella Risk Assessments to Landlords for Rented Residential properties. We also provide Floor Plans for Residential and Commercial property for marketing purposes. We offer the service that WE would want to receive personally ourselves - Professional, 100% Accurate & Efficient. Q – I’m selling my house privately, do I require a HIP? With effect from May 20th 2010 the Government announced that HIPs were to be suspended. As a result a HIP is no longer a requirement, however, an Energy Performance Certificate is still required if you are marketing your property, even if it’s just putting a ‘for sale’ sign in the window, you need an EPC. Q - When do I need to obtain an Energy Performance Certificate? An Energy Performance Certificate is required on the sale or letting of a property. If Selling - the EPC must be ordered prior to the commencment of the marketing process & there is a 28 day window from that date in which to have the EPC in place. If Letting - the obligation is to produce an EPC at the time the property is first offered for rent. The landlord must ensure a copy of the EPC including the recommendation report is made available free of charge to all prospective tenants at the earliest possible opportunity, and no later than the entering into of a rental contract. Q- Does this requirement apply to all residential tenancy? No ....... If a tenant was in occupation before 1st October 2008 and carries on occupying the property after that date, the landlord is not required to produce an EPC, even when that tenancy comes to an end and is re-newed. If however at the end of that tenancy the tenant leaves and a new tenancy is created then an EPC will be required. Please contact us if you have any questions or wish discuss how we can meet your Domestic or Commercial EPC requirements. 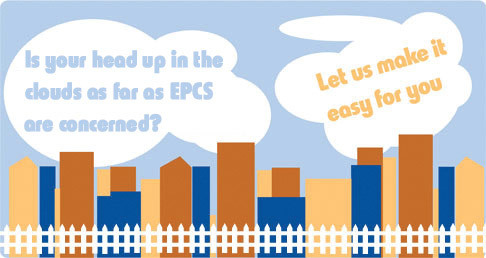 EPC Solutions (Kent) provide Energy Performance Certificates and Floor Plans. We welcome instructions from Private Individuals marketing their own property as well as Property Professionals involved in the compilation of Home Information Packs looking for longer-term business relationships.